The New Zealand iPhone and Samsung cases by Wolfkamp and Stone were so popular Live Wires NZ Ltd have released some new designs by Tanya Wolfkamp for the latest Samsung Galaxy S5. 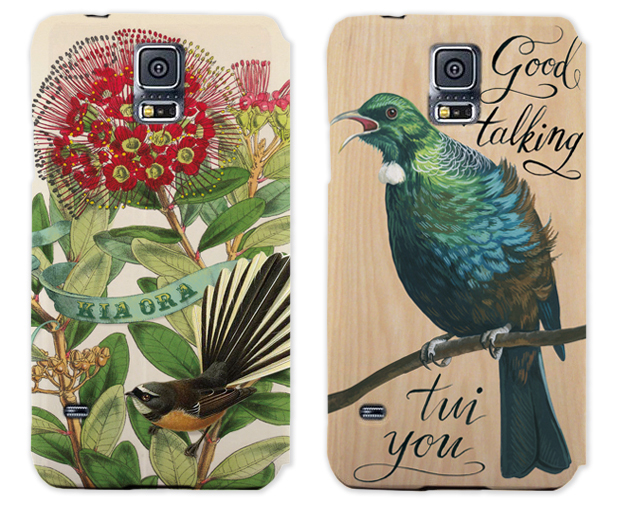 The designs are ‘Piwakawaka‘ New Zealand Rata and Fantail and ‘Good talking tui you‘ with a singing tui bird on a wood-grained background. For more in the Samsung range click here. For all wholesale orders or to find a retailer near you contact Live Wires NZ Ltd.
For online sales we suggest the IKO IKO online store.